Fully furnished 1100 sq. 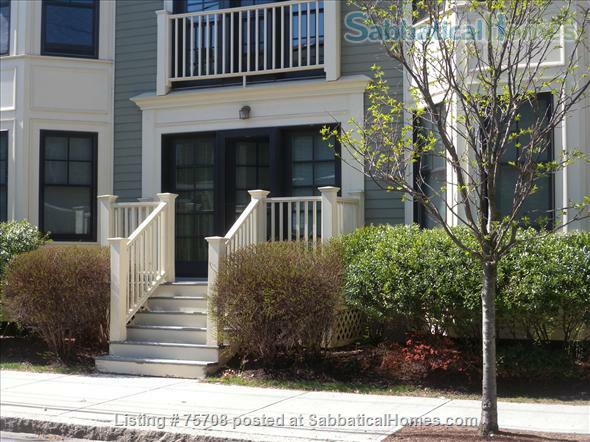 ft. 2BR condo with porch and private entrance in family-friendly Cambridgeport neighborhood. Beautiful parks around the corner with water features, sand pits, basketball courts, tennis courts. Master suite, two full bathrooms, in-unit washer and dryer, dishwasher, central air, and full kitchen. Kids' room has twin bunk beds and lots of books and toys. Great work space - wireless internet, standing desk with new flat screen monitor, big desks in the living room for work or art projects. Complex includes an exercise room and gated grassy courtyard. Walk to Harvard, Harvard Business School, shops, restaurants, the Charles River, the Red Line, public outdoor pool, and great public libraries. Three subway stops from Boston Common and Public Gardens. Pets considered. Underground parking (a boon in Cambridge!). We have done three wonderful overseas swaps in the past few years. We are two adults, two children, and one well-mannered dog who would would love to swap with a family in South Bend, Indiana from August/September 2015 through June 2016.